On Friday, I sailed to the Eddystone Lighthouse. The Inshore Waters forecast reads:Lyme Regis to Lands End including the Isles of Scilly. Wind: west 4 or 5, backing southeast 3 or 4. State: moderate becoming slight. 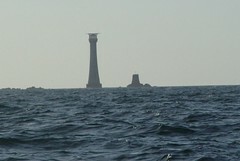 The Eddystone is west of south out of Plymouth, some 10 miles off Rame Head. The gps says it’s 24.2 nautical miles from Blue Mistress’ mooring to a point one mile eastward of the light and back.A steady south east wind means a close reach out and a broader reach home.It’s a great day to go, if you start early. I start late, dropping the mooring at 1220 on a falling tide. The clouds are beginning to clear.The wind is heading me up the Tamar, so, to make up some time, I motor into Plymouth Sound, passing across the ‘bridge’, the narrow passage that spans the shallows west of Drake Island. I set sail immediately, pleased to shut down the engine. It feels like cheating to motor the previous 2 miles. Second error, on the mooring, I rigged the working foresail. It seemed right at the time, but, now we are sailing, it is obviously too small and heavy for the wind. It takes Blue Mistress across the Sound and out to sea but too slowly. I will have a good sail, but I won’t make the Eddystone and back by dark.I delay changing to the lighter jenny to watch Brittany Ferries’ Pont Aven to pass. There is no clue to whether it is heading for Roscoff or Santander.Third error, perhaps less of one, I am too close and she takes our wind – but not till she is at least a quarter mile passed us. We roll and flap for a while in the turbulence and she swings swiftly on her way – oblivious. 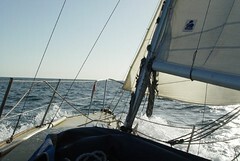 Fourth error, I have forgotten to rig the jack lines, which I only remember when I am in the bow changing headsails. The swell is not particularly uncomfortable, but there is always a point at which the voice on your shoulder reminds you – mine can be quite strident sometimes, like an overexcited parrot! But the jenny makes all the difference; we romp along at over 5 knots, into the sun, with the lighthouse visible on the horizon. Now it’s a question of will we be able to get there and back before dark? I set a time of 1530 to turn for home. At 1540, the lighthouse bore due West, 1 mile, (how good timing was that? ),and we turned for home, increasing our speed to an average of over 5.5 knots to be back in the Sound a half hour ahead of time. We goose-winged gently up the Tamar on a dying wind as the sun set ahead of us over Cornwall and, having picked up the mooring and set the boat right, I rowed ashore in the gathering gloom. I wrote this with the thought that I would just state the facts (that parrot again), but I cannot avoid the romance of it. I am sure it means little to anyone else, but I find it difficult to write this without a leap in my heart – on Friday, I sailed to the Eddystone Light.